A study into the effects of high mechanical pressure on the polyiodide TEAI showed that it brings unusually high electrical conductivity starting from insulating state, suggesting that the material may be useful as a switchable semiconductor. This system could represent an alternative to gel electrolytes and ionic liquids in dye-synthesized solar cells. The paper, "Pressure-induced Polymerization and Electrical Conductivity of a Polyiodide," has been published in Angewandte Chemie. Polyiodides exhibit useful electrochemical properties such as charge-carrier transportation, high electrolyte energy density, high redox reaction reversibility and a wide range of electrical conductivity, all depending on the forces exerted by the organic counter ions—chemical pressure. For this reason, polyiodides have been used in technical applications in electronic and electrochemical devices such as flow batteries, fuel cells, dye sensitized solar cells and optical devices. 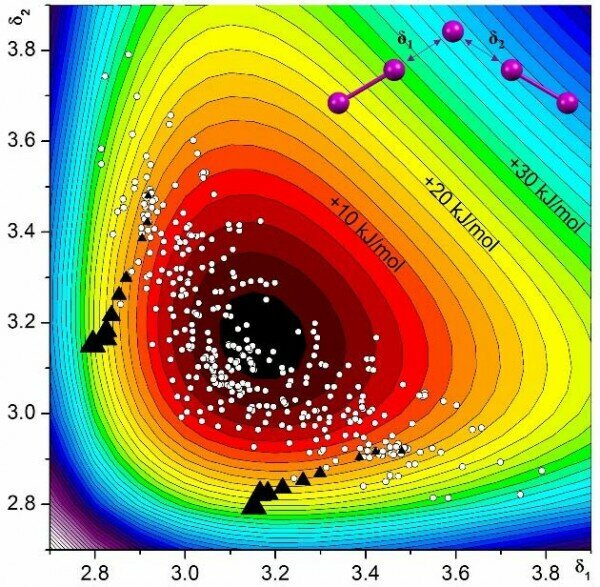 In this study, researchers led by Prof. Piero Macchi at the University of Bern and Dr. Nicola Casati at PSI used powder and single-crystal X-ray diffraction, electrical conductivity, and first principle calculations to investigate the response of one polyiodide, tetraethylammonium di-iodine triiodide (TEAI), to compression achieved by mechanical pressure.